San Juan Islands Washington Luxury Lodging offers nothing but the most comfortable accommodations, superb hospitality, and attention to detail, designed to help you relax and truly enjoy your vacation in San Juan Islands WA. Discover opulence in these beautiful San Juan Islands Washington Luxury Hotels and Lodges. Stay at this stunning modern dwelling on your Island vacation. Great views and beautiful design. 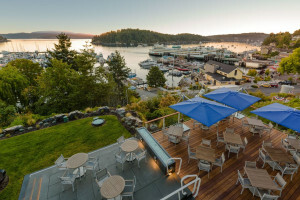 This elegant and luxurious spa is connected to historic Roche Harbor Resort. The spa offers a full range of treatments from Massages to Bath & Body to Bridal packages. Luxurious accommodations and delicious breakfasts at this centrally located B&B. Chose from 6 guest rooms, 7 suites and 2 cottages - something for everyone.